"Flag Gullivera" The trademark "Flag Gullivera" was registered in the Federal service for intellectual property, patents and trademarks, the copyright holder of which is LLC "Lastochka". These cookies are ones of the most famous. They are admired by customers in all parts of the country. They are packaged in a flow-pack on 335 g.
The trademark "Flag Gullivera" was registered in the Federal service for intellectual property, patents and trademarks, the copyright holder of which is LLC "Lastochka". These cookies are ones of the most famous. They are admired by customers in all parts of the country. 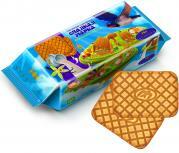 They are packaged in a flow-pack on 335 g.
"Flag Gullivera" with glaze and decor Sugar cookies «Flag Gullivera» glazed, made of the flour of the first type, the lower surface is covered with confectionery glaze, the top of the product is decorated with the same glaze, they have a rectangular shape. They are packaged in a flow-pack on 420 g.
Sugar cookies «Flag Gullivera» glazed, made of the flour of the first type, the lower surface is covered with confectionery glaze, the top of the product is decorated with the same glaze, they have a rectangular shape. They are packaged in a flow-pack on 420 g.
"Mudryj Mu" The taste of baked milk in these wonderful cookies will guve a pleasant touch to the tea party, create a warm friendly mood at the table. They are packaged in a flow-pack on 370 g.
The taste of baked milk in these wonderful cookies will guve a pleasant touch to the tea party, create a warm friendly mood at the table. They are packaged in a flow-pack on 370 g.
"Bosi-Bosi" These cookies have the perfect taste of a walnut a little savory and sweet. Light, golden, crispy, delicious – they simply melt in your mouth. 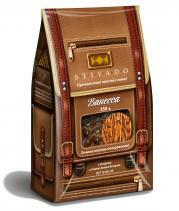 They are packaged in a flow-pack 370 g.
These cookies have the perfect taste of a walnut a little savory and sweet. Light, golden, crispy, delicious – they simply melt in your mouth. They are packaged in a flow-pack 370 g.
"Sladkaya marka" Cookies immediately melt in your mouth and a pleasant vanilla-creamy aroma creates a feeling of warmth and harmony. They are packaged in a flow-pack 260 g.
Cookies immediately melt in your mouth and a pleasant vanilla-creamy aroma creates a feeling of warmth and harmony. They are packaged in a flow-pack 260 g.
"Zoloteya" Tender cookies with a pleasant creamy taste creating a fantastic mood and a sweet atmosphere of childhood and home coziness. They are packaged in a flow-pack 360 g.
Tender cookies with a pleasant creamy taste creating a fantastic mood and a sweet atmosphere of childhood and home coziness. They are packaged in a flow-pack 360 g.
"Liliputia" Cookies with a unique individual taste of condensed milk will give you a feeeling of carefree childhood happiness and pleasure. They are packaged in a flow-pack 360 g.
Cookies with a unique individual taste of condensed milk will give you a feeeling of carefree childhood happiness and pleasure. They are packaged in a flow-pack 360 g.
"Ya igrayu!" Small sugar cookies with figures of animals and cars will give children joy, surprise and an unforgettable taste of caramel. They are packaged in a flow-pack on 335 g.
Small sugar cookies with figures of animals and cars will give children joy, surprise and an unforgettable taste of caramel. They are packaged in a flow-pack on 335 g.
"Sladkie gnomiki" An unusual shape of relief dwarfs will undoubtedly attract attention of the young ones having a sweet tooth, who will definitely love the taste of condensed milk. They are packaged in a flow-pack on 335 g.
An unusual shape of relief dwarfs will undoubtedly attract attention of the young ones having a sweet tooth, who will definitely love the taste of condensed milk. They are packaged in a flow-pack on 335 g.
"Liliputia" with glaze and dark-white decor Additional information - the flavour of condensed milk. 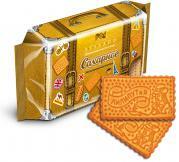 Packed 430 g.
Additional information - the flavour of condensed milk. Packed 430 g.
"Pochemuchka" with glaze and dark-white decor Additional information - the flavour of yoghurt. 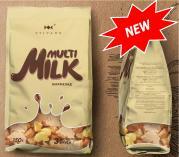 Packed 450 g.
Additional information - the flavour of yoghurt. Packed 450 g.
"Vanessa" with glaze and dark-white décor They are made of wheat flour of the 1 type, oat flour and oatmeal. It has a round shape. White milk and dark with cocoa confectionery glaze in harmony with the taste of oatmeal cookies. 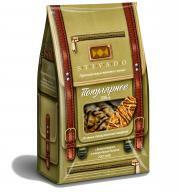 They are packaged in a pack 350 g.
They are made of wheat flour of the 1 type, oat flour and oatmeal. It has a round shape. White milk and dark with cocoa confectionery glaze in harmony with the taste of oatmeal cookies. They are packaged in a pack 350 g.
"Populyarnoe" with white glaze and dark-white decor Sugar cookies made of flour of type 1, the lower surface is covered with white confectionery glaze, the top of the product is decorated with dark and white confectionary glaze. It is a fantastic combination of the shape and vanilla-cream flavor, without which no tea ceremony is possible. They are packaged in a pack 335 g.
Sugar cookies made of flour of type 1, the lower surface is covered with white confectionery glaze, the top of the product is decorated with dark and white confectionary glaze. It is a fantastic combination of the shape and vanilla-cream flavor, without which no tea ceremony is possible. They are packaged in a pack 335 g.
"Marmilanti" Jelly fruit marmelade with sugar covering.It has various shapes. The surface is powdered with sugar. It is produced in a set containing 6 kinds of different colors and flavors: raspberry, green apple, black currant, lemon, peach, apricot; packed 250 g.
Jelly fruit marmelade with sugar covering.It has various shapes. The surface is powdered with sugar. It is produced in a set containing 6 kinds of different colors and flavors: raspberry, green apple, black currant, lemon, peach, apricot; packed 250 g.
"Marmilanti" 150 g Jelly fruit marmelade with sugar covering.It has various shapes. The surface is powdered with sugar. It is produced in a set containing 6 kinds of different colors and flavors: raspberry, green apple, black currant, lemon, peach, apricot; packed 150 g.
Jelly fruit marmelade with sugar covering.It has various shapes. The surface is powdered with sugar. It is produced in a set containing 6 kinds of different colors and flavors: raspberry, green apple, black currant, lemon, peach, apricot; packed 150 g.
"Limpasetki" Jelly fruit glossy marmelade. It is in the shape of toys. The surface is glossy and shiny. Produced in a set containing 6 kinds of different colours and flavors: raspberry, green apple, black currant, lemon, peach, apricot; packed - 250 g.
Jelly fruit glossy marmelade. It is in the shape of toys. The surface is glossy and shiny. Produced in a set containing 6 kinds of different colours and flavors: raspberry, green apple, black currant, lemon, peach, apricot; packed - 250 g.
"Limpasetki" 150 g Jelly fruit glossy marmelade. It is in the shape of toys. The surface is glossy and shiny. Produced in a set containing 6 kinds of different colours and flavors: raspberry, green apple, black currant, lemon, peach, apricot; packed - 150 g.
Jelly fruit glossy marmelade. It is in the shape of toys. The surface is glossy and shiny. 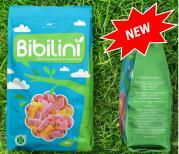 Produced in a set containing 6 kinds of different colours and flavors: raspberry, green apple, black currant, lemon, peach, apricot; packed - 150 g.
"Bibilini" Jelly fruit glossy marmelade. It is in the shape of toys. The surface is glossy and shiny. It is produced a set that contains five kinds of different colors and flavours: black currant, raspberry, apple, lemon, orange. Packed 250 g.
Jelly fruit glossy marmelade. It is in the shape of toys. The surface is glossy and shiny. It is produced a set that contains five kinds of different colors and flavours: black currant, raspberry, apple, lemon, orange. Packed 250 g.
"Bibilini" 150 g Jelly fruit glossy marmelade. It is in the shape of toys. The surface is glossy and shiny. It is produced a set that contains five kinds of different colors and flavours: black currant, raspberry, apple, lemon, orange. Packed 150 g.
Jelly fruit glossy marmelade. It is in the shape of toys. The surface is glossy and shiny. It is produced a set that contains five kinds of different colors and flavours: black currant, raspberry, apple, lemon, orange. Packed 150 g.
"Multimilk" Jelly shaped glossy marmelade. It is in the shape of cows. The surface is glossy. It is produced in a set that contains three kinds of jelly with milk shade in the flavor: condensed, baked, boiled condensed milk. Packed 250 g.
Jelly shaped glossy marmelade. It is in the shape of cows. The surface is glossy. It is produced in a set that contains three kinds of jelly with milk shade in the flavor: condensed, baked, boiled condensed milk. Packed 250 g.
"Multimilk" 150 g Jelly shaped glossy marmelade. It is in the shape of cows. The surface is glossy. It is produced in a set that contains three kinds of jelly with milk shade in the flavor: condensed, baked, boiled condensed milk. Packed 150 g.
Jelly shaped glossy marmelade. It is in the shape of cows. The surface is glossy. It is produced in a set that contains three kinds of jelly with milk shade in the flavor: condensed, baked, boiled condensed milk. Packed 150 g.
"Sancarin" assorted Soft chewing caramel without filling Sancarin® assorted flavours: cream, cappuccino, almond, Irish. Packed 335g. and 200g. Soft chewing caramel without filling Sancarin® assorted flavours: cream, cappuccino, almond, Irish. Packed 335g. and 200g. "Goodcrut" Soft chewing caramel without filling Goodcrut ® assorted flavours: lemon-coffee, lemon-orange, mango-pineapple, grapefruit-mint. 335g. and 200g. Soft chewing caramel without filling Goodcrut ® assorted flavours: lemon-coffee, lemon-orange, mango-pineapple, grapefruit-mint. 335g. and 200g. "Aximola" Soft chewing caramel with filling Aximola® assorted flavours: yoghurt-strawberry, yoghurt-blueberry, yoghurt-kivi, yoghurt-peach. 335g. and 200g. Soft chewing caramel with filling Aximola® assorted flavours: yoghurt-strawberry, yoghurt-blueberry, yoghurt-kivi, yoghurt-peach. 335g. and 200g. 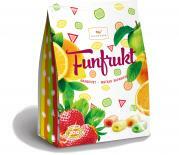 New "Funfrukt" Soft chewing caramel with filling Funfrukt assorted flavours: orange, lemon, strawberry, apple. 200g. Soft chewing caramel with filling Funfrukt assorted flavours: orange, lemon, strawberry, apple. 200g.